Minimal or limited desk surface area may cause users to set workstation equipment in unpreferred positions. This awkward placement may lead to uncomfortable postures such as reaching for a mouse or turning your neck to view a monitor placed to the side. • View the monitor at a distance of 20-40 inches. • Position the monitor directly in front of you. Note: A corner desk usually provides additional desk space than the sides of a rectangular desk and would be able to accommodate multiple components such as dual monitors. 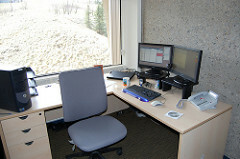 Some desks have hard angled edges that may cause contact stress when a user’s wrist rests on it. This can affect the nerves and blood vessels, causing wrist injury. • To minimize contact stress, consider using wrist rests, gel pads, or other inexpensive material. Too much clutter under the desk may lead to awkward sitting positions and/or discomfort. • Clear enough room under your desk for your legs and feet. • Limit the number of storage boxes and other miscellaneous items that are stored under your desk.